This was an absolutely addicting journey, and some of the most fun reading I have had this year. This book surpasses the first Bloodsounder's Arc book, which was excellent and I gave 4.5 stars to, in terms of writing, depth, plot, and character and world building. Everything Jeff Salyard's did great in Scourge of the Betrayer, he does even better here. I love Jeff Salyard's writing. It exudes atmosphere; I am able to enter into the world he has created and exist. The dialogue is among the best in fantasy. Each character has a unique voice and it was such a pleasure reading the different characters go back and forth. I usually prefer narration to dialogue when reading but this novel has really opened up a new world to me. I often skim dialogue and find it boring but the writer here really brought this group of soldiers to life. It was clever, funny, crass, and often over-the-top and there was always something interesting being said which kept me turning pages at stop lights, dinner, check-out lines, walking to my car, taking out the trash, etc. These Syldoon soldiers are as tough and grim as any in fiction. The narrator, Arki, who is a scribe by trade, was less grim but had strong character development as well. I enjoyed every character in this book. There was never a time I wished a scene would end as is often the case for me and I will skim a particular character I don't really care about. Even in excellent books such as the ASoFaI series, there are numerous people I really don't care about. There is a decent amount of characters, perhaps 7 or 8, which play large parts. This strongly appeals to me as I do not like books with 30 or 50 or more minor characters as well as the 10 or 20 main characters and the book goes on for 1000 pages. Recently, I gave up on 2 very famous books because there were just hundreds of characters and I felt I needed to keep notes or constantly consult a Wiki. I do not like that and my patience wears thin with that. In no way am I implying this book does not have depth because it does. It is just very, very focused. 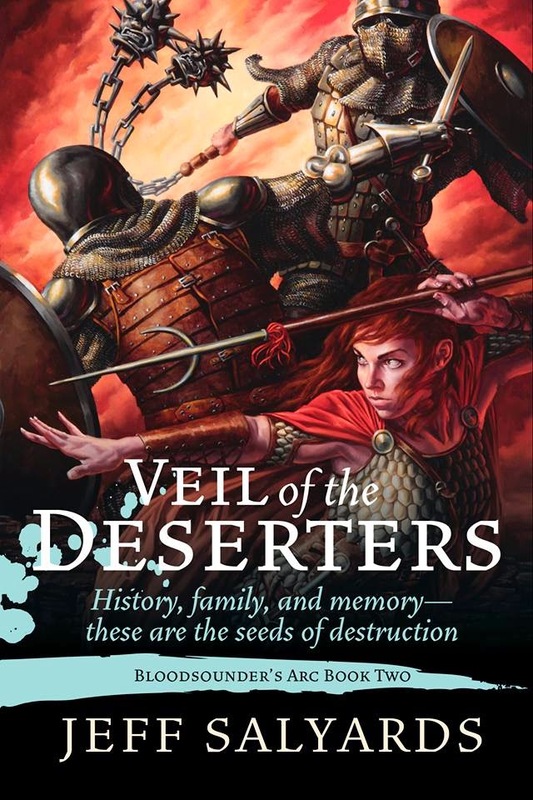 In 450 or so pages, Jeff Salyards is able to create a world and characters as rich as any secondary fantasy world. The first book, Scourge of the Betrayer, had some solid world building and I mentioned in my review the author dropped hints of a much larger world to explore. And I was right in a major way! This book is loaded with relevant history and journeys to numerous locations around the region. We learn some of the major characters backstories, giving an added layer of depth to already great character development. We learn more about the religion in this world through numerous plot devices (I say "plot devices" because I don't want to give spoilers). We learn some history of the Godveil, which we almost knew nothing about after the first book. We get more information about Bloodsounder, Captain Braylar's flail. Magic enters much stronger in this book, a unique system involving memory magic, which is I loved learning about. As for the plot, it was full of mystery and had me anticipating and guessing what would happen next and most of the time I was very surprised. The action scenes were written expertly and there were many types of warfare including sieges, ambushes, and shieldwalls. It felt like the writer was a veteran soldier of numerous campaigns. The pace was perfect, heavy on action and advanced quickly, with brief pauses in which to learn some needed history of the world or characters. There were no pointless parts in this book which seemed like a waste of time or just something to take up pages. I can't recommend this book enough. Even if you did not read the first book in this series, this book can stand on its own. And if you did read the first book, you should be able to get right back into this world. Within 20 pages, it felt like no time passed between this book and the last one even though I have probably read 50 books since then. And if you do start with this book, you will surely want to read the first one because you will crave more of Braylar's adventures. I sometimes find it lazy to compare a book to another book in a review but it is inevitable here. It had a very similar feel to Joe Abercrombie's First Law books well as Glen Cook's Black Company series. If you are looking for something in that style, this is a must read series! Wonderful review Phil! I too loved the first book. I cannot wait to get my teeth stuck into this. I'll let you know what I think of it! Thanks, Phil, for the fantastic review. You're welcome Jeff and thank you David! Look forward to your thoughts.